Waiting for the law to be enforced. "We are waiting for the law to be enforced." How does that sentence affect you? When safety is on the line, isn't it scary to think that we have to push to enforce the law and frantically wave our arms to get someone to pay attention? Last week, I learned of a very unfortunate story of air pollution harming a local church and it's 600+ members. 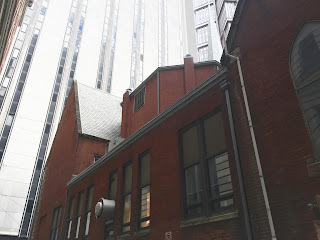 After reading a Pittsburgh Post Gazette article titled, "Hotel Monaco restaurant ordered to pay $4,850 fine for violating air pollution enforcement order," I decided to pay a visit to downtown Pittsburgh with a Speck in hand. 1. The newly renovated Hotel Monaco flexed its restaurant muscles and opened The Commoner on January 20, 2015. On its website, the Commoner promotes hand-smoked meats, an homage to the Steel City's industrial past, and a love for local which extends to their menu. 2. 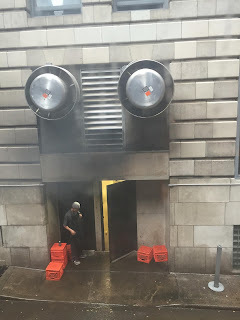 The restaurant's exhaust from the grill, wood-fired oven, and conventional oven was built to spit out to a small alley between it's own hotel (built in 1903) and the First English Evangelical Lutheran Church (built in 1887). 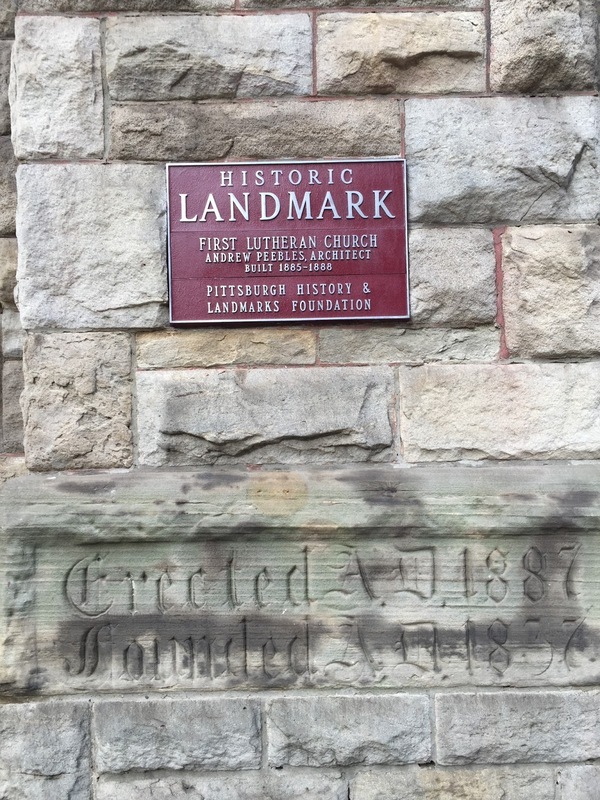 Both buildings have historical landmark status. Below is a photo that I took from Rev. Brian Evans' window. 3. 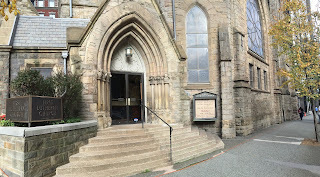 The Church's air intake system is located on the side of the alley, as shown below. Now, without knowing anything about air pollution and fine particulate matter, you can see from the photos that the buildings are covered in soot and grime. Gross. 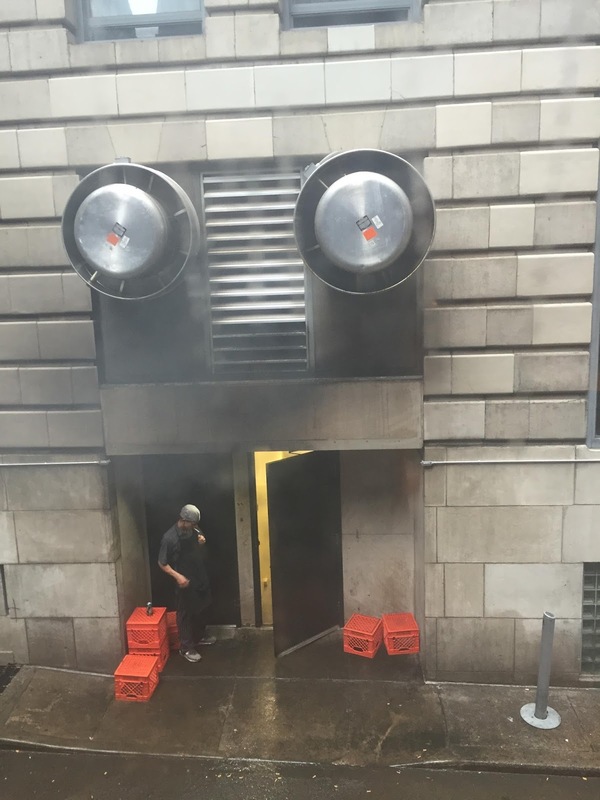 You can also imagine what it's like to live next to a restaurant like this - you see smoke in your home, your fire alarms go off and disrupt your home life, your family heirlooms and personal belongings get covered in grease, and you constantly smell like cheeseburgers. I don't know about you, but that doesn't sound like much fun to me, and Rev. Evans and his 500+ church member don't like it either. 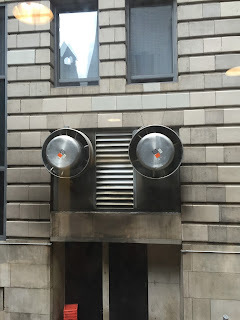 The Commoner is aware that any act of combustion (smoking, lighting wood-fired ovens, burning candles, etc.) causes particles (an EPA monitored pollutant) to be released into the air. Fine particles are too small to be seen by the naked eye, cannot be coughed out and are subsequently released into the bloodstream; therefore causing serious adverse health effects. Fine particles are linked to asthma, heart disease, rheumatoid arthritis, autism, and more. 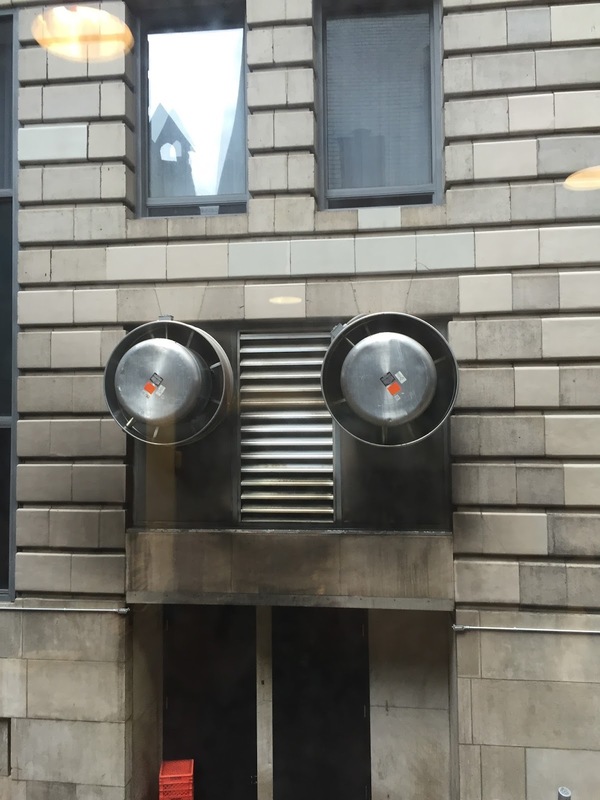 The exhaust from this restaurant directly throws an unsafe amount of fine particles into the Church and the surrounding area. As a result, the Church's organ is covered in soot, does not function properly, and will cost about $10,000 to clean. The Church's employees watch smoke flood the inside of their building (including their place of worship), go home smelling like wood smoke, and have been prescribed inhalers due to the amount of fine particles that they inhale from the restaurant's pollution. 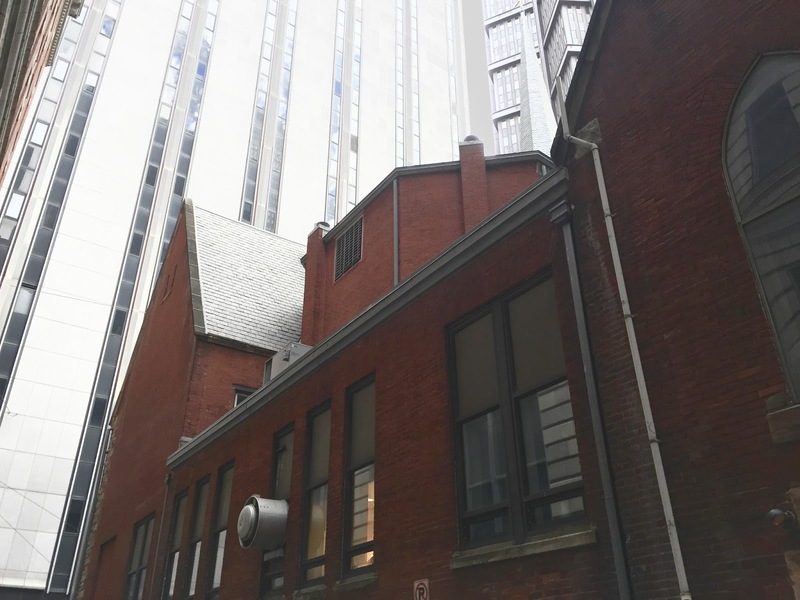 In addition, the Church's basement (heated via forced air) hosts Sunday School programs for K-12 children, and children have been coughing more than normal due to the increased amount of air pollution from the restaurant. If you have not yet read about the adverse health effects of fine particles on children, check out this, or this, or this, or this, or the hundreds of other articles via a simple google search. 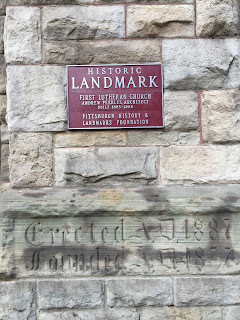 The Hotel Monaco, awarded for Excellence in Historic Preservation, is ironically now ruining it's own historical exterior and the exterior of the historical landmark right next door, the First English Evangelical Lutheran Church. Remember how the Commoner promotes hand-smoked meats, an homage to the Steel City's industrial past, and a love for local which extends to their menu? 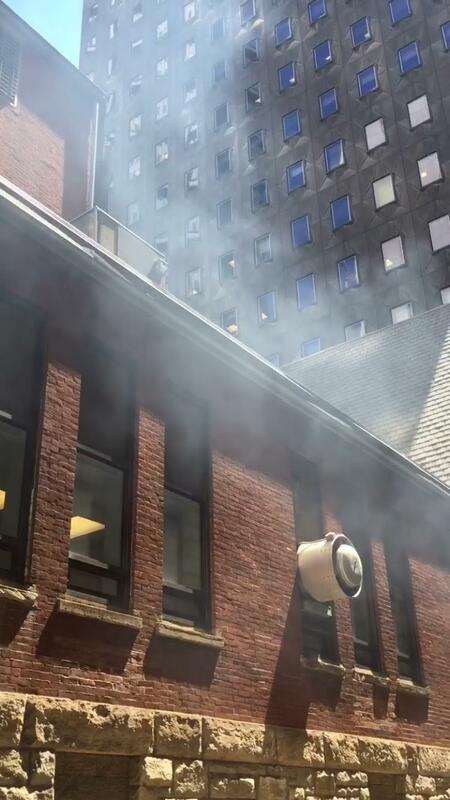 From my perspective, those hand-smoked meats produce pollution that is not correctly filtered and the only homage to our Steel City's industrial past are the 2 soot-covered buildings that remind me of Pittsburgh in the 1940's. So what about the love for local? Deposits of air pollution directly cause soil pollution. Do you want to eat local food that has been polluted with air contaminates? Now, despite the obvious negative health effects of the Church members and staff, The Commoner is fighting off any legal punishment. No fines have been paid. No law has been enforced. No member of Mayor Peduto's office has responded to this, despite multiple attempts. I haven't visited The Commoner to comment on the quality of the food, and I will not be patronizing anytime soon. The Commoner is breaking the law, ruining historical buildings, and directly jeopardizing people's health without punishment. There are now 3 Specks sitting in the Church and the readings jump when the restaurant exhaust is turned on. I don't like hearing that we have to "wait for the law to be enforced." My hope is that with Speck and a strong safety advocacy community behind us, Pittsburgh will not continue to experience profit > planet.